English playwright and architect, a leading exponent of the English Baroque. In 1699 John Vanbrugh took over the design of Castle Howard, from William Talman, and worked with Nicholas Hawksmoor. 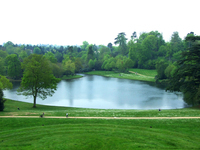 The two men also designed Blenheim Palace and Seaton Delavel. Vanbrugh owned Claremont for a time and built his own house, Vanbrugh Castle on the east side Greenwich Park. 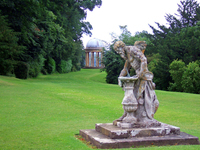 John Vanbrugh was also involved with garden design. This came about because, as a former stage designer, he always had an interest in the combination of architecture and landscape. John Vanbrugh worked with Bridgeman at Stowe and Claremont.